I have an idea for an improved clock and wanted to see how they are now made. One side of the crystal has a trace that has 4 solder bridges which must terminate in capacitors on the IC under the epoxy blob. Most likely in a binary weighting. In the manufacturing process the free running frequency of the mechanism could be measured with a counter and then using a look up table the operator puts solder bridges on the proper pads. In my case from top to bottom it's closed, closed, open, closed. The impedance of watch crystals is extremely high so you can not probe the crystal circuit to measure the actual oscillation frequency. 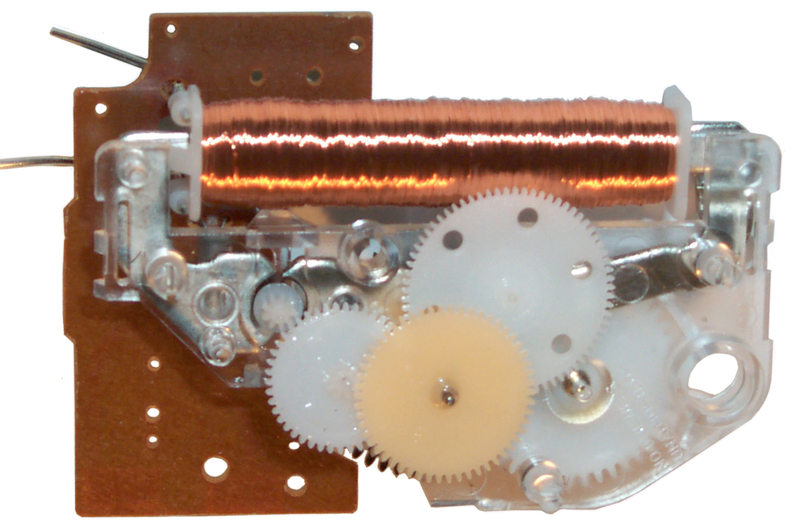 What was done here is to use a pair of pogp probes to measure the coil drive pulse per second. The length of that time interval should be exactly one second. A positive pulse of 1.37 volts lasting 46 ms is followed 1 second later with a negative pulse of 1.37 volts lasting 46 ms. 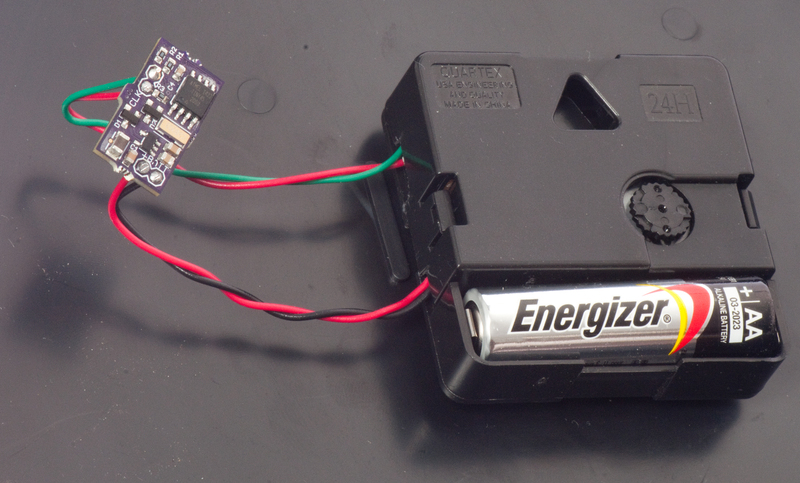 This means that the IC uses a full H bridge circuit in order to get the bi polar drive from a single 1.5 volt AA cell. On back of clock: Spartus, Quartz, Made in U.S.A. 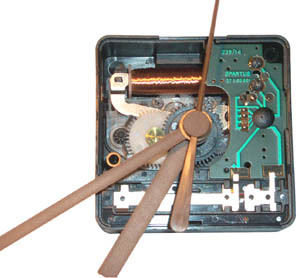 In order to use the movement when driven from a more precise time base than the on board crystal this movement was removed from an old kitchen clock. This was done by prying the clear cover tabs and pushing so the clear cover could be removed. Then the tabs paper dial and hands were removed. Finally the movement was pushed out the front after the tabs on the frame were held back. A number of plastic hooks hold the mechanism into the movement box. All but one of these can be seen and with a small screwdriver pried enough to lift the mechanism up a little. But the one under the printed circuit board seemed impossible to get to, so I cut a hole in the box. Here a bottom view. Note that three gears and a flat spring dropped off and have been reassembled for this photo. 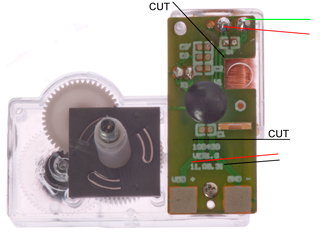 The small white plastic circle at the 10 o'clock position of the leftmost gear is the armature. Here the three loose gears have been taken back out to show the metal magnetic path and the armature. The armature is made from a permanent magnet, but I don't yet understand how it works. 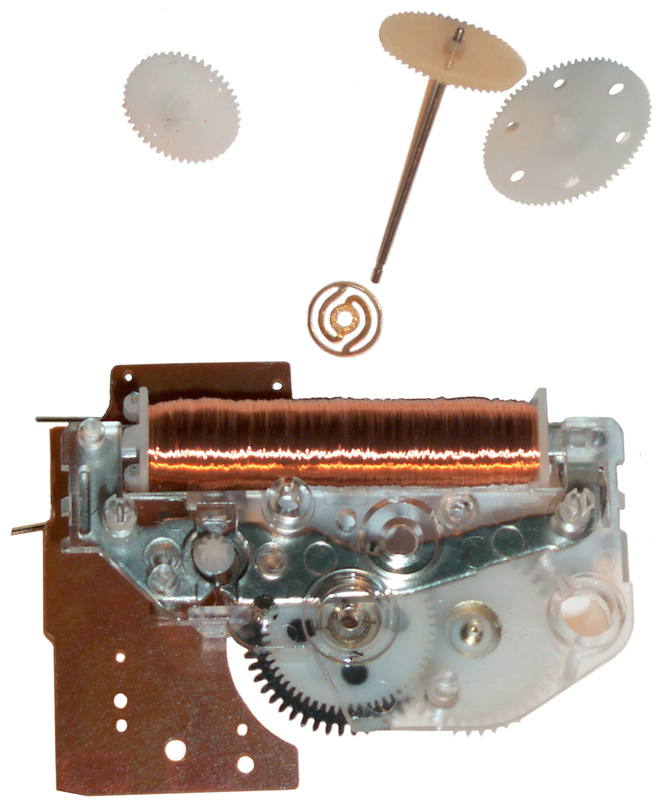 1405502 Electric motor, Dodds Lee L, Feb 7, 1922, 310/49.47 - intended for slave clocks, but is a bipolar DC drive using 4 coils. 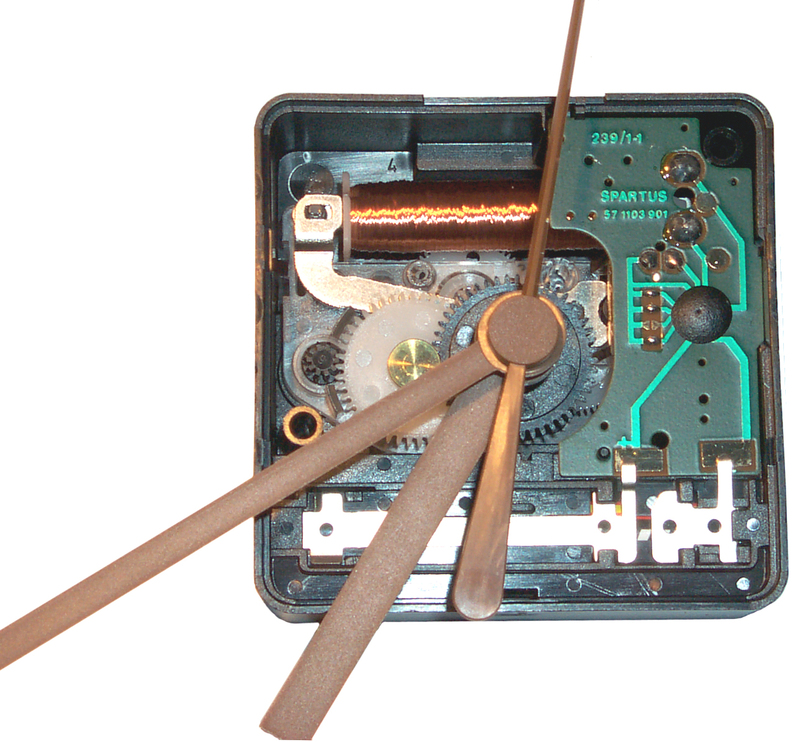 In 2014 there was some interest in "Crazy Clocks" where the time would stop and then run fast. To make these a small printed circuit board was put on the market with a number of different versions of the Crazy Clock and one of those versions was for a clock that tells sidereal time (Wiki). To be useful a sidereal clock needs to tell Local Mean Sidereal Time not some universal sidereal time, i.e. to take into account your longitude offset from the center of your time zone. That way if you know the Right Ascension (Wiki) of a star that's the sidereal time when the star crosses your local North - South meridian. To make this clock I started with a "10" Zulu Time 24 Hour Wall Clock" from eBay seller pilotmallaviationsuperstore and a "Crazy Clock" PCB with the Sidereal option. fingers on the back in and out using a screw driver and remove. Note the hands are all at midnight. Pull off the second hand. Remove the nut and minute hand. Pull off the hour hand. Remove the nut and washer and remove the Quartex 24h movement. The instructions on how to open the Quartex are on the Crazy Clock web page. shown below and solder wires as shown below. Cut notches in the plastic cover to clear the wires. 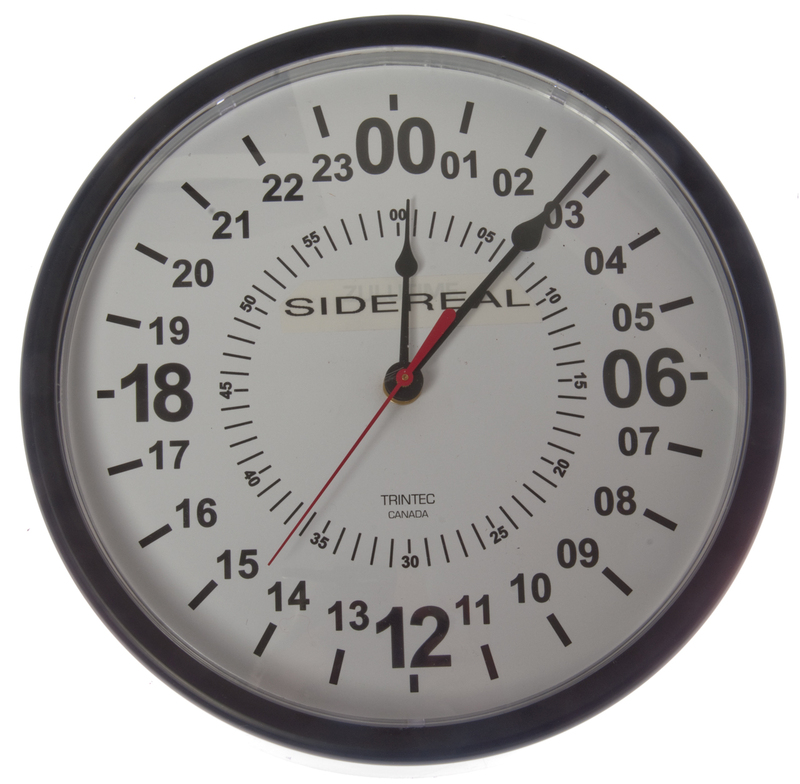 Place "SIDEREAL" label over Zulu Time. Solder red wire to Batt+ and black wire to Batt-. I don't think it matters which motor wire goes to which terminal. Fig 2 Crazy Clock board installed in clock. To set the clock you can use the USNO LST web page: Compute Local Apparent Sidereal Time or an app on your cell phone for LMST. PS. Since the clock comes with all three hands pointing to midnight, it makes it much easier to start up the clock at midnight LST or shortly thereafter. That way you do not need to rotate the time setting dial a million turns.